Here are some tips and tricks to maintaining a healthy lawn during extremely hot summer months here in Southern California. A common mistake made by both landscapers and homeowners is cutting a lawn too short in summer. During hot summer days a lawn cut too short will dramatically affect the turf’s ability to produce energy and maintain healthy root growth. Never cut off more than one-third of the grass height at one time. Taller grass develops stronger roots that support more vigorous plants that are more tolerant of stress. Extra watering during summer months is fine, just don’t over do it. Turf grasses do best in slightly damp, not wet soil conditions. Too much water can lead to oxygen deprivation of roots and lead to disease. It is best to water deeply during pre-dawn hours rather than several shallow waterings throughout the day. A healthy lawn only requires about an inch of water per week to thrive. Check your mower blade. Is it sharp? Are you noticing grass blades that are torn or jagged? Jagged cuts from a dull blade can stifle turf growth. A sharp cut allows the plant to heal faster and you won’t get the edge browning often seen after a dull blade mowing. Use clippings as a mulch. If you have a mulch setting on your mower, use it. Clippings are beneficial to the lawn as they act as a slow-release fertilizer as they decompose. Mulched clippings also help retain soil moisture from evaporation. During the hot summer months, your lawn is in conservation mode. Fertilizer stimulates growth which can over stress turf in survival mode and lead to significant damage to your lawn. 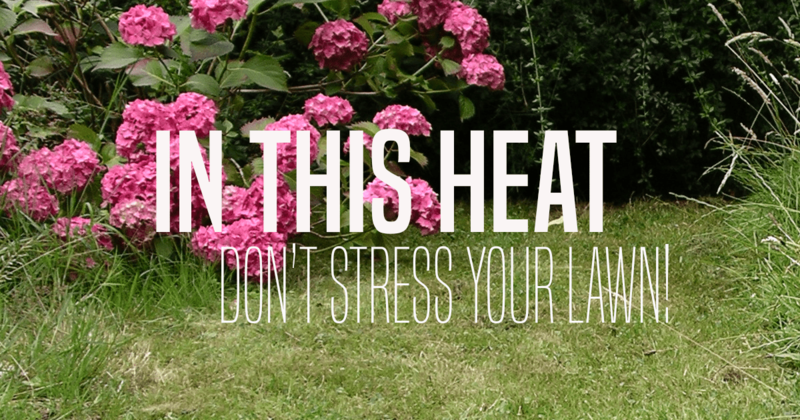 Resist any aggressive lawn care during hot summer months. De-thatch, aerate, and fertilize in the fall when your lawn is more stable and weather is cooler.